The Charlotte Shootout is open to area club teams. The Charlotte Shootout is on the same day and the same location as the NC Champions Challenge. Proceeds from both events benefit the Wounded Warrior Project. The Champions Challenge is an annual fundraiser for the Wounded Warrior Project that features the best-of-the-best high school teams in the state playing the same day in the stadium at the Sportsplex at Matthews. A one-day event where all teams play three games each, plus a championship game for the top two teams in each division. Each game consists of four, twelve minute running time, quarters. The schedule is set - Teams play one hour and off the next. All teams have a max five-hour day (six hours if you make the championship!). The Venue: All games layed at the Sportsplex at Matthews - Charlotte, NC - All games played on sport-turf and all games guaranteed. 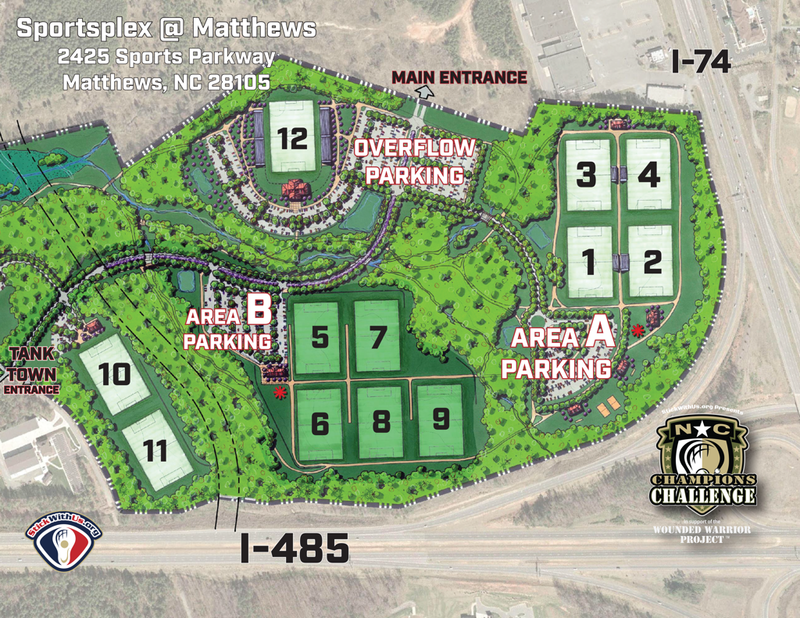 Newly renovated Sportsplex at Matthews features 11 turf fields and plenty of newly added parking.